Note: This is the bound book only and does not include access to the Enhanced Pearson eText. To order the Enhanced Pearson eText packaged with a bound book, use ISBN 0134290054. This life-span approach to parent-child relations gives students a comprehensive, contemporary look at theories, research, and techniques within historical and cultural contexts. It covers every stage of development, including older parents and their adult children, and uses an inclusive approach that looks at a variety of different family contexts, such as foster families, military families, and families with an LGBTQ member, as well as the influence of culture and ethnicity on family beliefs and behaviors. The first chapter focuses on the history of theoretical and research influences of childrearing to help students understand why parents today hold certain beliefs regarding how to raise children. Theory and research are then interwoven through the book. 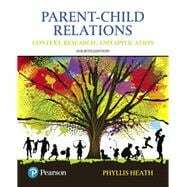 An early chapter on strategies and techniques also sets the stage for upcoming discussions of parent-child relations. Written with the student in mind, the book presents numerous examples. Critical thinking questions in every chapter encourage students to stop and consider their views regarding the material, and Spotlight features throughout provide examples of the influence of technology, diversity, and poverty on families. The Enhanced Pearson eText version includes embedded video examples and Test Your Knowledge quizzes with feedback that enable students to check their understanding of the material. Phyllis Heath is Professor Emerita, Central Michigan University. Her research focus has included parent-child relations in various contexts and cultures, including indigenous cultures in Mexico and South Africa. Her previous textbooks published by Pearson Education include previous editions of Parent-Child Relations in 2005, 2009 and 2013.